0.47 (according to other sources 0.6) ha per each resident (0.9 ha of agricultural grounds) twice as many as in Germany, France, England. Totally, there are 9,011.5 thousand ha of agricultural lands, including 7,484.7 thousand ha (83.1 percent) with agricultural organizations, 62.8 thousand ha (0.7 percent), 130.5 thousand ha with peasant (farming) organizations (1.4 percent), facilitating estates of rural residents cover 880.7 thousand ha (9.8 percent). 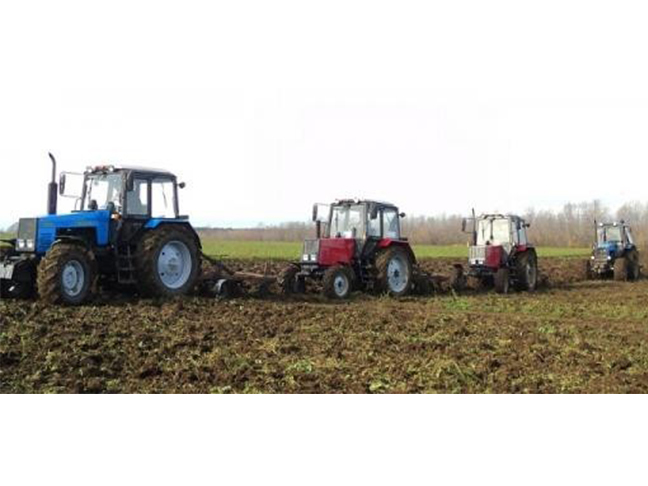 Now intensive agricultural production is the major direction of agricultural economics in Belarus. It demands significant expenses for labor force and machinery, as well as for fuel, power costs to produce a unit of production are 3 to 4 times higher than in the USA. Contamination of lands, water, and atmosphere with mineral fertilizers, pesticides, heavy metals. The share of agriculture in pollution of the atmosphere with СО2 comprises about 23 percent. About 830 thousand ha of agricultural grounds are contaminated with industrial waste, 6 percent of agricultural grounds are contaminated with biogenic elements in the concentrations exceeding the maximally permissible rates (MPC). The situation is aggravated with the fact that about 23 percent of the territory underwent radioactive contamination as a result of Chernobyl accident. Degradation of soils (chemical, physical, and biological). In Belarus, degraded and erosion hazardous soils include 2.6 million ha of arable lands (on the whole, 4 million ha or 19 percent of the overall territory of the country). As of the present moment, 1.45 million ha of peat bogs are drained, including 1.1 million ha for agricultural needs. The peat layer is rapidly degrading, and is destroyed in some cases. Thickening of arable lands. Excessive usage of machinery for processing of soils led to their thickening and violation of its structure, which strengthens the processes of erosion of lands. Accumulation of toxic substances including heavy metals in foodstuffs. Appearance of persistent races of vermin and pathogenic agents as a result of broad application of pesticides, which led to the appearance of a “catch 22”: application of pesticides is the cause of persistence, and the dosage shall be increased or new means of protection shall be developed, to which vermin and pathogenic agents adapt again, and their numbers are growing again. Increase of contamination of fields with weeds due to long-term application of herbicides with narrow scope. Decrease of yield and increase of costs of agricultural production. Social problems of villages in our country are not less serious than the ecological ones. Demographic situation is very unfavorable, as the youth moves to towns and cities, the birth rate is extremely low. Despite high level of unemployment, there very little qualified labor force in villages. Salaries are low in this field of economics, and significant funds are needed to create your own farming estate. There has not been a land reform in Belarus. The new Land Code was adopted in 1999, in compliance with which all lands of agricultural purpose were assigned as the state property. There is only private property for a land lot with a house (not more than 0.15 ha) and for homestead land up to 1 ha allowed. Citizens have the right to rent up to 2 ha of lands for personal farming purposed and own a land lot up to 1 ha in private property. Farmers can receive up to 100 ha of land into usage but not into property. The government does not create favorable conditions for development of private farms. The law “On Peasant Farming Economics” was adopted on February, 18, 1991, revised on July, 19, 2005. The law was imperfect and caused serious critics from farmers: equal rights of farmers with other agricultural producers were not provided for, private property for land was not provided for either, the procedure of allocation of lands was not established. The law did not provide for a possibility to provide farming cooperatives and associations. In accordance with Decree of the President No.193 of April, 1, 1998, farmers shall conclude agreements with local authorities, in which they must provide for conditions of land usage, structure of production, types and volumes of goods and production resources, which will be produced and purchased. This draft agreement is being prepared by governmental authorities. Such practice hampers a farmer’s work. Not all farmers conclude such agreements, but unless they conclude it, they cannot count on financial support. According to assessments, farmers receive 7 to 10 times less state support compared to other agricultural enterprises. Governmental program of support of private farms is almost terminated. Most farmers, who stopped their businesses, did it because of lack of financing. Credits for farmers are provided at 12 percent per annum, but taking surcharges into account (credit insurance, rate of increase of prices), as a result it comprises 20 to 30 percent. According to assessments of the World Bank experts, contemporary macro-economical policy in Belarus is not favorable for development of efficient agriculture. Agricultural markets are under control of the state and local authorities. Price regulation is combined with administrative limitations (licensing, etc.). On the whole, taxation does not favor the development of agricultural production, though agricultural producers have taxation preferences. At the same time, agriculture is taxed with indirect taxes with the help of price regulation. Due to the applicable policy, revenues of producers are limited to 2 percent monthly, while expenses are not limited. The Ministry of Agriculture and Food and local authorities set extreme prices for agricultural production. Export of foodstuffs is monopolized by the state. Informational and statistical reporting does not provide for implementation of deep economic analysis, validity of statistical data makes experts, particularly those of the World Bank, doubt it. In Belarus, there is administrative control system, including agriculture. The operations of the agricultural sector are controlled by the Ministry of Agriculture and Food. The reply on ecological agriculture in Belarus brought the reply that development of ecological agriculture is not the priority direction in Belarus.